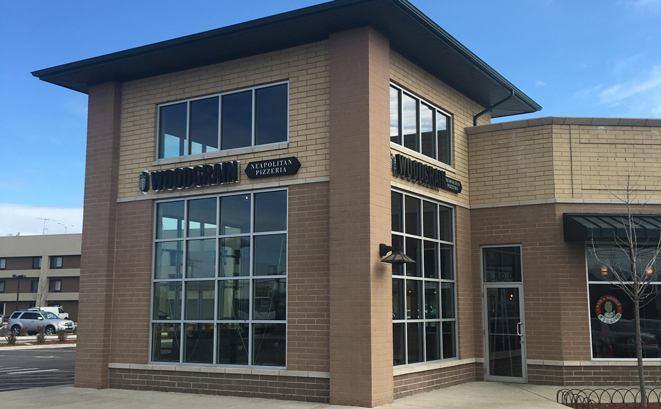 Woodgrain Neapolitan Pizzeria in Glenview plans to begin serving alcohol on Monday, a restaurant manager said. The Village Board voted unanimously on April 5 to grant a liquor license to the recently opened pizzeria, 1615 Milwaukee Ave.
General manager Carlos Felfle described the restaurant to the board as a "fast, casual pizza place." Both he and manager Paul DeSario said business has been brisk at Neapolitan and is improving daily. "We look to be an added value to the community," Felfle said. "We're already in operation and doing phenomenally. Everyday gets a little better." The Glenview restaurant, which opened in November, is the second for the brand, DeSario said. The first opened in Westmont, he said. "It's going fantastic," DeSario said. "We're up 10 percent every week since we opened. The Westmont store started a lot better, but we're catching up real fast." Woodgrain in Glenview has seating for 60 people and will serve only beer and wine, he said. The restaurant also offers carryout, DeSario said. Woodgrain serves pizza with no sugar, dairy products or gluten, if requested, DeSario said. "It's unique because of the speed (in which) it cooks, but also the ingredients we use," he said. "We do everything fresh daily, from veggie deliveries to meat. Even our gluten-free pizza we make in house. We also offer dairy-free cheese for someone with a dairy allergy." Besides pizza, the only other food the restaurant serves is salads, DeSario said. "It's a simple menu," he said. "You're in and out. From the time you order and get your pizza, it's five minutes." The restaurant is open from 11 a.m. to 10 p.m. Sundays through Thursdays and from 11 a.m. to 11 p.m. on Fridays and Saturdays, DeSario said. Woodgrain Neapolitan Pizzeria in Glenview plans to begin serving alcohol on Monday, a restaurant manager said. The Village Board voted unanimously on April 5 to grant a liquor license to the recently opened pizzeria, 1615 Milwaukee Ave.
© Copyright 2019. Woodgrain Neopolitan Pizzeria Inc. All Rights Reserved.